According to the late Pierce Comerford (1944-2010), right,Coolgreaney House, near Castlewarren, Co Kilkenny was built in 1653 and has been home to his branch of the Comerford family for eight generations. 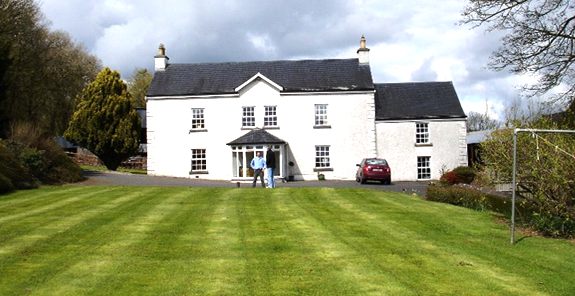 Coolgreaney House sits in a beautiful setting in north Co Kilkenny, surrounded by a grove of trees that were planted by earlier generations of the family, including one tree said to have been grown from a seed brought back in his pocket from America by one family member. According to Barney Comerford, Richard Comerford (ca 1660-ca 1714) of Ballybur and his son William Comerford (ca 1692?-post 1765) lived at Coolgreany, Co Kilkenny. [See Chapter 4: Comerford of Ballybur Castle and Kilkenny City Prim and other authorities show William lived in Kilkenny City and moved to the Langton House at The Butterslip, Kilkenny, after the marriage of his son James Comerford and Anne Langton in 1754. William Comerford’s grandson, Michael Comerford, later recalled how William took an oaken chest of title deeds with him to the Butterslip, and on sunny days would take them out and unfold them. These were believed by family members to be the title deeds to Ballybur; after his death, they were inherited by his elder son James Comerford, but are believed to have been destroyed by James Comerford’s wife, Anne. William Comerford’s sons included James Comerford (ca 1720-ca 1808), of Kilkenny, ancestor of the Comerfords of Langton, The Butterslip, Kilkenny [see Chapter 4: Comerford of Ballybur Castle and Kilkenny City] and Edmund Comerford (ca 1722-1788), ancestor of the Comerford family of Newtownbarry (Bunclody), Co Wexford [See Chapter 8: Comerford of Bunclody and Dublin]. He was probably also the father of Patrick Comerford (d. ca 1787), of Ryland, outside Newtownbarry (Bunclody), Co Wexford, and Edward Comerford, ancestor of the Comerford families of Newbawn and Horetown [See Chapter 11: Comerford of Horetown, Newbawn, &c, Co Wexford]. Barney Comerford also says William Comerford was also the father of Matthew Comerford, who married Elizabeth Bolton, and Pierce Comerford, of Coolgreany, Co Kilkenny, who was born ca 1732, and was ancestor of the later Pierce Comerford of Coolgreaney House. Pierce Comerford of Coolgreany House was born in 1944 and died on 7 February 2010. Shortly before he died, Pierce told his family story to local researchers, recalling in particular one ancestor, Nicholas Comerford (1780-1870). 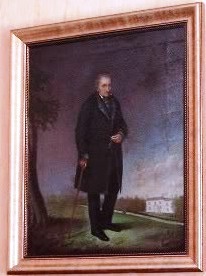 Nicholas Comerford was living at Coolgreany at the time of Griffith’s Valuation (ca 1849/1850), and his portrait still hangs in Coolgreany House. Pierce’s grandfather, also named Pierce Comerford (born ca 1874), was working in Arnott’s in 1898 when he was selected to play on the Arnott’s Dublin team that won the All-Ireland Football final that year. The medal was presented in 1899 and remained in the possession of Pierce Comerford of Coolgreaney House a century later. Pierce Comerford the footballer later returned to Co Kilkenny and married Mary (Molly) Hogan. They were living at Coolgreany House at the time of the 1911 Census, when he was aged 37, Mary was 35, and they had one son and one daughter; Mary (3) and Thomas Comerford (2). Pierce described his paternal grandmother, Molly Hogan, as a resourceful woman who looked after the workers well, and who would carry eggs to Dublin in her Morris Minor for sale. Pierce’s mother nursed in England during the war years. When he finished his education, Pierce Comerford emigrated to Canada. But because of his father’s ill health, he returned home after a year to take care of his home place. Pierce Comerford died at Coolgreany House on 7 February 2010 after a long illness bravely borne. He was survived by his wife Breda, his son, Ian Comerford, and four daughters, Claire, Ruth, Ciara and Valerie, his brother Jimmy Comerford, his son-in-law, brothers-in-law, uncles, aunts, and an extended family. After his funeral mass in Castlewarren Church, he was buried in the adjoining cemetery. Griffith’s Valuation, Co Kilkenny (ca 1849/1850). The Irish Times, 8 and 9 February 2010. Maurice O’Keeffe, Irish life and lore series, Clara parish collection, Clara heritage society, Clara, Co Kilkenny, Catalogue of 29 Recordings (privately published, Tralee and Clara, 2009), p. 11.